During my hands-on play session with The Elder Scrolls Online at the media event last week, I got a glimpse of the early game experience, and it was delicious. But most MMOs are judged on what awaits players at the max-level endgame, so I sat down with ZeniMax Online Studios creative director Paul Sage to ask about those areas of the game that I didn’t get to see. Specifically, I asked Sage to describe ZeniMax’s strategy for keeping players occupied once they hit the level cap at 50. His reply included four main activities: questing in enemy alliance zones, four-player dungeons, adventure zones, and the PvP alliance war in Cyrodiil. Read on for all of the details I gleaned from the interview! 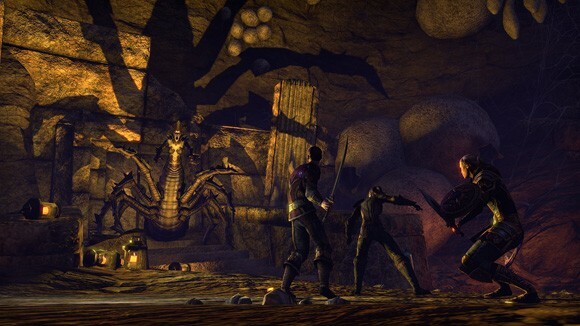 In ESO, you choose one of three alliances, each with different zones, quests, and stories to explore. Once you hit level 50, you can choose to journey to another alliance’s territory and experience a more difficult (and rewarding) version of those areas. After you complete the story within in the second alliance, you can travel to the third faction and complete the content there. According to Sage, this content is the endgame for a solo player or someone who plays with just a friend or two. Since the Elder Scrolls franchise has been a single-player affair up until this point, it’s wise to include scads of content for that audience. It’s also ideal for the player who wants to soak up all of the lore and learn the history of Tamriel 1000 years before the events of Skyrim. With each alliance area containing 120-150 hours of content, there’s a lot of exploring to do. The endgame for a small group of friends can be the instanced dungeons found in the world. There is a four-player dungeon in each of the game’s 16 zones; most dungeons boast a second level 50 version with a different storyline. Small groups of friends can spend countless hours refining strategies and accruing rewards in the nearly 30 different dungeon experiences ESO will have at launch. When I asked Sage about raiding, he said that ESO’s adventure zones are designed for larger groups of PvE players. You can actually go into the adventure zones with a small group and accomplish some goals, but there are large areas in these maps dedicated to larger group experiences. There will be some warning when you’re about to trigger one of these encounters (and they may even end up instanced), so a small group won’t suddenly find itself face to face with a Daedric Prince! The last pillar in ESO’s endgame is the Alliance War, which is designed with the PvP player in mind. Players of all three factions will meet in Cyrodiil (a zone roughly nine times the size of a normal map) to wrestle over keeps, resources, and bragging rights. It’s hard to argue with that logic. I was able to witness a live demonstration of a keep assault in Cyrodiil, and it looked incredible. Trebuchets launched huge boulders at the fortress while defenders scurried along its walls in an attempt to pour boiling oil down upon the manned battering rams. The Q&A team was engaged in a 30v30 skirmish that ran with smooth frame rates, and we got to see the carnage that ensues once a keep wall is breached. While keep sieges can involve hundreds of players, Sage stressed that there were also activities in the Alliance War geared toward small groups or even solo players. Smaller parties can snipe any enemies that lag behind or wander too far from larger battles. There are also small goals like overtaking enemy farms and mines to secure resources for your alliance. Since the Elder Scrolls Online employs a megaserver technology that allows the entire population to play together, there was a danger of players encountering unending queues to participate in the three-faction war. 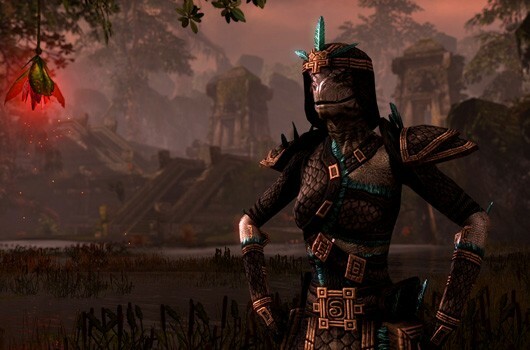 ZeniMax’s solution is to split Cyrodiil into persistent instances called campaigns that new characters are assigned to. Campaigns allow the developers to maintain some level of control over the populations engaged in the Alliance War as well as combat faction imbalances. 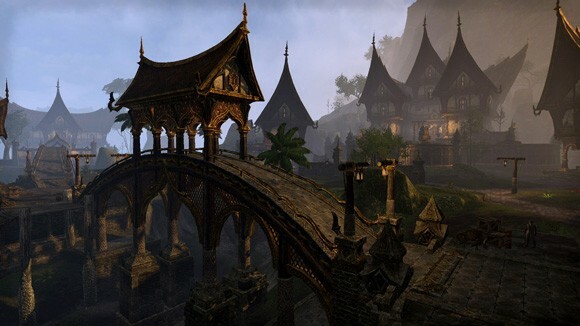 Sage explained that if the Ebonheart Pact on one particular campaign was struggling a bit, the devs could assign an influx of new characters to that faction to even things out. It’s not a perfect solution as those players may not choose to engage in PvP, but if one side gets too strong, the other two factions can work together to beat it back. Guild Wars 2 also offers large-scale three-faction PvP with its world vs. world feature, but it’s been plagued since launch by an issue known as culling. Culling causes a delay in when enemy models render on your screen in order to curtail major performance issues when massive numbers of players are on the screen. Guild Wars 2 hopes to remedy this issue in the March game update, but I was curious how this issue is being tackled in ESO. 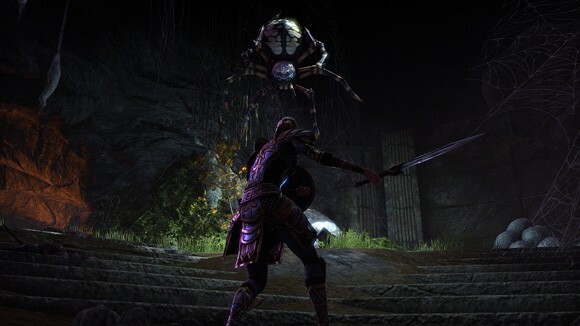 Sage emphasized that ZeniMax built ESO with the goal to have 200 players on the screen at once without performance issues or culling. He told me that testing on minimum spec machines has proven that it can be done and that ZeniMax is extremely focused on metrics and getting this right. Given studio head Matt Firor’s Dark Age of Camelot pedigree, it’s easy to see the source of that confidence. Lastly, on the PvP front, I asked what sort of progression system there will be for players who participate in alliance battles. Besides being able to level from 10 to 50 by engaging in PvP in Cyrodiil, players will earn alliance points by completing various objectives. You can spend alliance points on different things, such as gear, and there will be a running total of lifetime alliance points earned, which can be used to show off on leaderboards. While a three-alliance system works perfectly for ZeniMax’s PvP plans, I was skeptical about its impact on other areas of the game. Part of the reason the megaserver technology was designed is to eliminate issues that always creep up during MMO launches with groups of friends ending up on different servers. Having three separate alliances (each with three different races) shifts the problem from needing to coordinate server choice to which faction are your friends going to be. I was curious to hear Sage’s take on the impact of three-way PvP, and he agreed that the studio had to make some concessions in order for players to feel a certain allegiance to their faction. We were told during an open Q&A session that communication across factions won’t be permitted. At this point, I started to get nervous about a possible design misstep because splitting your playerbase into thirds can be detrimental when you’re trying to get a group together for any cooperative activity, such as a dungeon run. Sage assuaged most of my fears, however, when he mentioned that once you hit level 50 and decide to play in another alliance’s areas, you’ll be able to play with friends in that faction. So at the endgame, things begin to open up and you can group up, chat, and run dungeons with players of other factions. The one area where things remain separate is, of course, the Alliance War in Cyrodiil. I wonder, however, whether it’s necessary to segregate the population at all provided folks are in the non-PvP areas. I understand ZeniMax’s desire for players to feel attached to their chosen alliance, but it seems clunky to allow people to cooperate only after they’ve reached max level. Furthermore, the way it sounds, the ability to group up and communicate with other factions is enabled only once you trigger some mechanism that allows you to experience one of the other faction’s stories. Do you need to play through two full alliance stories in order to unlock communication with the third faction’s players? I sure hope that is not the case. He then explained that crafting would remain viable at endgame because it’s used to enhance any of the items you find in the world. This approach will certainly make crafting fanatics happy as they throw themselves into the five professions that ESO has to offer: provisioner (cooking), weaponsmith, armorsmith, alchemy, and enchanting. Players will have a limited number of points to use toward crafting disciplines, so they will have to choose whether they will master one trade or become decent in all of them. At the conclusion of the interview, I found myself even more impressed with what the Elder Scrolls Online could bring to the industry. ZeniMax has the delicate task of appealing to both MMO and Elder Scrolls fans, but from what I’ve seen, it’s up for the challenge. Want to hear more about my experiences at the media event? I also got some hands-on time with an Orc Sorcerer.